Registration remains open through May 9, 2019. The CMT Level I Exam focuses on the basic knowledge of the terminology and analytical tools used in technical analysis. The exam is two hours long, and consists of 132 multiple-choice questions. As of January 2019, the CMT Association has discontinued its membership requirement for CMT exam candidates. You may still choose to become an affiliate member before enrolling in the CMT Program, but it is no longer required. However, member pricing for the exams differs from nonmember pricing. 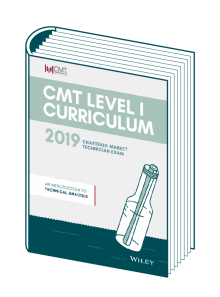 For additional information about the CMT Level I Exam, please consult the Exam Information document below for selected sample questions and a brief overview of the exam structure. This document is not meant as a study guide; rather, it is offered to acquaint you with the style and format of the exams. This chart illustrates the Knowledge Domains covered by the CMT Level I exam. Click on each domain to view sub-domain topics covered in each domain area. A list of Learning Objectives appears at the beginning of each chapter in the text. These are intended as a guide to the most important concepts discussed in the chapter. An effective study method is to read the Learning Objectives as an introduction to a chapter before beginning study of the chapter. After completing the chapter, review the Learning Objectives again and write a few sentences that demonstrate competence on that topic. An integral part of the CMT Association’s mission is to establish, maintain, and encourage the highest standards of professional competence and ethics among our membership. As such, CMT Association members must abide by the Code and Standards and are encouraged to notify their employer of this responsibility. Violations may result in disciplinary sanctions by the CMT Association. Sanctions can include revocation of membership and the right to use the CMT designation. Candidates should know that all three levels of the CMT Program include questions pertaining to the Code and Standards. Below you will find a link to the Code and Standards from the CFA Institute which have been licensed by the CMT Association on behalf of its members. All references to “CFA Institute,” “members,” “candidates,” “CFA Program,” etc. in the Code and Standards should be read to apply to the CMT Association and its members, candidates, programs, etc. When preparing for the CMT exams, candidates are encouraged to review the Standards of Practice Handbook. According to the CFA Institute, “the Standards of Practice Handbook grounds the concepts covered in the Code and Standards for practical use. You can use this handbook for guidance on how to navigate ethical dilemmas you might face in your daily professional life.” Reviewing the Handbook provides candidates with a comprehensive study process and commensurate preparation for professional practice.